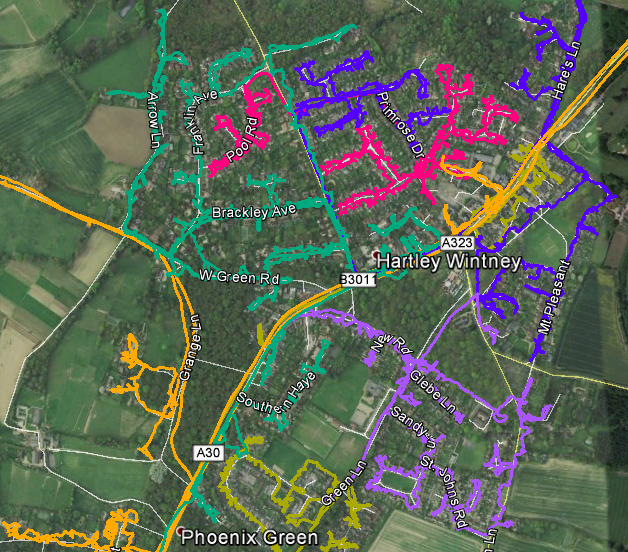 For reliable and ethical GPS tracked leaflet distribution Hartley Wintney RG27, Shareplan Leaflet Distribution can offer you a complete service. Hartley Wintney is a large village in the county of Hampshire, particularly well know for its abundance of antique shops. The town is also home to the famous Elvetham Hotel, rebuilt in 1860 by Teulon. It was formally the secondary home of Queen Jane Seymour’s father and her nephew entertained Queen Elizabeth I there. It is now a banqueting and conference venue with seventy hotel bedrooms. Hartley Wintney also boasts very good road links as it is situated on the A30 junction with the A323 Fleet Road and also close to the M3. Through our geoplan map we know the total number of residential delivery count is 2255. Approximately 74% of these properties are either owned outright or with a mortgage or loan. This data can help you position your product and services to the targeted demographic audience, such as offering glass glazing services to these home owners who want their homes to be more heating efficient. Our Hartley Wintney leaflet delivery service is second to none. Every single one of our flyer distributions are carried out using a GPS device. We will then provide you with a report on completion of the door-to-door distribution. Taking only a couple of moments to download the data, you can then view the exact route the post person took to deliver your flyers. In addition to providing cost effective and dependable door-to-door delivery in Hartley Wintney, we also offer geotargeting to make sure you are delivering to the correct target audience. You can provide us with particular estates in an area in Hampshire, for example, and we will supply a report and map showing the number of residential deliverable properties. Your leaflet design is key to ensuring your leaflet delivery campaign is as lucrative and efficient as possible. Our free one-to-one consultation gives you the unique opportunity to engage with one of our in-house marketing experts. After all, we want your campaign to be as successful as possible because the more successful you are, the more successful we are! If you have no idea at all where you want to start with your door-to-door delivery campaign, you can even use our graphic design service; our in-house design team will help you get the most from your direct response marketing. Of course, our first-rate leaflet delivery service wouldn’t be complete without giving you the unique opportunity to get amazingly low prices on your leaflet printing! Make savings on your door-to-door distribution when you order both your leaflet printing and leaflet delivery together from us! With our flyer distribution service attracting a repeat business rate of over 78% in Hampshire, you can’t go wrong with Shareplan Leaflet Distribution’s complete service. Click the link to get your free quote now! Our door-to-door distribution is available in all the main towns in Hampshire including: Basingstoke, Tadley, Hook, Aldershot, Farnborough, Blackwater, Yateley and Fleet. Please feel free to take a look at our other coverage areas and also visit our FAQ if you have any other unanswered questions.